I have been stamping and scrapbooking for the past 10 years. It is my favorite hobby and I sure do miss it when life gets way too busy. I have 3 amazing children, and a wonderful, supportive husband. Today I would like to share with you a creation I made for today's Your Next Stamp Challenge!!!! Today's challenge is a FUN one, To make any shaped card except a square!!! For my creation today I decided to make a fun circle card hope you enjoy!!!! We’d love to see you use a YNS stamp on your challenge card/creation, but if you don’t have one, then you can still join in and be entered into the prize draw (but please only enter one non-YNS creation per challenge). As our challenge runs for 2 whole weeks you have plenty of time to hop on over to the YNS Store and pick up some of these fun images yourself! If you do use a YNS stamp on your challenge card/creation, you’ll be entered into the prize draw TWICE and be entered into the Top Pick draw – that’s 3 chances to win! Thanks so much for stopping by today, I hope everyone has a GREAT Wednesday!!! What a great card Crystal! Brilliant card, Crysal! I adore the scene you have created! I love YNS stamps - really should invest! AWWW! Hunny, I'm so sorry to hear about your bad tooth ache!! I surely hope you are feeling better now!! Your card is so sweet and I love your colors with your round layout!! Too cute girl!! Oh now this is adorable. I love everything about it. What a great couple, they look so happy together. I am happy to hear you are feeling better. well it certainly hasn't affected your crafting! this is gorgeous! owwweee on the infection. i always said, there's nothing worse then a toothache..... until i had a backache. i've come to the conclusion that when SOMETHING hurts.... EVERYTHING hurts! glad you're back & feeling better. So glad you are on the mend- nothing worse then an infection. Glad you're starting to feel better! You deserve a break! I swear you're the most prolific card maker I know! This is another wonderful card! Glad you're feeling better!! Very cute card! 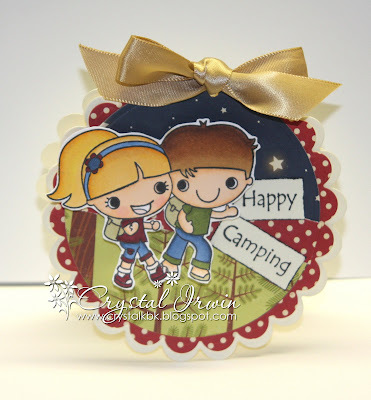 a very cute card Crystal, I love the design. So glad your feeling better. Oh Crystal I'm so glad you are feeling better! I knew you were in terrible pain and I know what you're talking about!!! Oh how cute your card is today! Love the round shape and the image is adorable... perfect for summer! Gorgeous coloring!!! Have a great rest of the week!!! Doesn't seem like you were down and out. You created a gorgeous shaped card Crystal! All mojo here! Your card is cute as a button! I hope you're feeling better, girl! I am sooo sorry to hear about your infected tooth, Crystal....glad to hear the antibiotics have kicked in and you are on the mend!!!! Your card is absolutely adorable!!!! I love the round card design and the images are sooo cute...gorgeous coloring and cutting, too!!! What a fun fun fun card!!!! Love it! Oh this is ADORABLE Crystal! I absolutely LOVE that image! What a fun, fun creation!! Oh what fun this is!! Fabby summer creation, Ms. Crystal! This is just too cute, love those stamps!